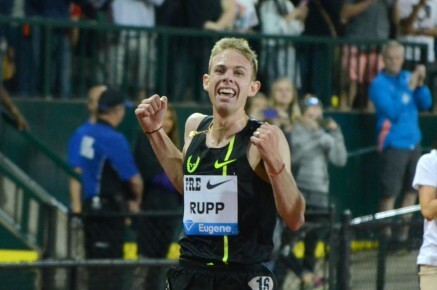 13th February 2016 – It was a dream marathon debut for Galen Rupp (USA) as he won the US Olympic Marathon Trials in Los Angeles and booked his ticket for the 2016 Rio Olympics. A large lead pack ticked off the miles early on and passed halfway in 66:32. Wary of the Los Angeles heat and heading into unknown Galen was content to sit in the pack and bide his time. Various athletes tried to apply pressure until the group was whittled down to just two. Galen made the decisive move at the 22 mile mark, finally breaking the resistance of Meb Keflezighi and striding out on his own. Galen never looked troubled as he crossed the line in 2:11:12 (64:40 for the second half) and was able to celebrate securing another US title.